Be the first to hear about their new releases and deals. Download the Booksprout app and search for Kate Kinsley today! 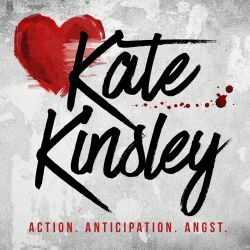 Kate Kinsley is the pen name of an Amazon bestselling author who’s gone incognito. She loves to write contemporary and military romance, but her passion is romantic suspense. Books with heart-pounding action, adrenaline-inducing chases, edge-of-your-seat thrills, life-threatening situations, and dangerous criminals are what she does best. Besides being a mom and wife, Kinsley loves spending time with her blue-eyed puppy, who likes snacking on paperbacks in his free time. When she isn't thinking up new, exciting plots, Kinsley enjoys white wine, dark chocolate, and lots of coffee – not necessarily in that order. Constant acts of bravery and defeating the bad guys is hard word, after all.